Secretary of the Army Peter Geren speaks congratulates the Army National Guard’s newest Citizen Soldier Justin Sanders (at left) and Joseph Rios at the Army’s recruiting ceremony October 1 at the Times Square Recruitment Center in New York City. The event marked the Army’s achievement of its 2008 recruiting effort, bringing in more than 170,000 new Soldiers to the Army, the Army Reserve and the Army National Guard. Sanders, from the Utah Army National Guard and Rios, from the New York Army National Guard, received their oath of enlistment from General William Wallace, commander of the Army’s Training and Doctrine Command. Members of the Army, Army Reserve and Army National Guard were all represented in the enlistment ceremony. U.S. Army photo by Lt. Col. Richard Goldenberg. NEW YORK -- The Army National Guard, Army Reserve and Active Army marked the successful end of the 2008 recruiting year with an enlistment ceremony honoring the Army’s 2008 “Faces of Strength” here at the Times Square recruiting station in the heart of Manhattan. 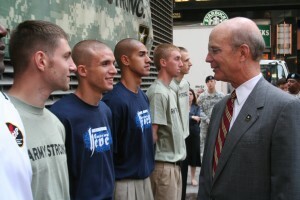 Welcoming the newest members of the Total Army to the force was the Honorable Pete Geren, Secretary of the Army. Among the nine enlistees were three members of the Army National Guard: Private Danielle Cote enlisting in the Alabama Army National Guard, Private Joseph Rios enlisting in the New York Army National Guard and Private Justin Sanders, joining the Utah Army National Guard. As part of the enlistment ceremony, Joseph Rios, the newest New York Army National Guard Citizen Soldier from the Bronx, remarked that the Army National Guard was an ideal way to keep his military service in the family. Rios will now serve alongside his brother Javier. “Everything the Guard offered outdid every branch in benefits, money, etc Joseph Rios, 19 said. “The fact that I would be a Citizen- Soldier would be interesting.” "It’s a family tradition for us - we wanted to become something more," said Javier Rios, 23, who joined the New York Army National Guard with his brother. The Rios brothers’ contributions to the overall recruiting effort helped the New York Army National Guard achieve a strength greater than 10,270 for the 2008 fiscal year, exceeding its goal of 10,100. This represents a net growth of 670 Soldiers during the year. Their enlistment while the Army is at war demonstrates their commitment to service, Geren said. A group of Soldiers representing the Army "Faces of Strength" also participated in the ceremony. They signified what young men and women become after being immersed in the Army training and value system. These Soldiers include decorated war veterans, an Olympic athlete, the Army’s two top Drill Sergeants of the Year and the Non-Commissioned Officer of the Year. “We are a nation long at war, seven years at war and today we are celebrating the 170 thousand men and women from all components who joined our ranks, Geren said. The Army faces the most challenging recruiting environment since the military became all-volunteer more than 35 years ago. Only three out of 10 Americans age 17 to 24 qualify for military service. The rest do not meet the Army’s standards for health, education or character, Geren said. "We are proud of the men and women who step forward in the middle of a war and raise their hand to serve," Geren said. "That tells you a lot about the character of those men and women, about their patriotism, about their commitment. They are the strength of our nation." The Army exceeded its 2008 fiscal year goal of 170,000 Soldiers by September 30, with more than 63,000 of those troops coming from the Army National Guard. The final report on the annual recruiting effort is expected in mid-October. Geren acknowledged that contribution from the Reserve Components when he remarked on the significant impact that New York Soldiers were currently making overseas. “There are today more than 700 Army Reservists serving overseas and some 2,000 Soldiers of the New York Army National Guard in Afghanistan and Iraq,” he added. The decision to hold the ceremony at the Times Square recruiting station was important, Geren explained.